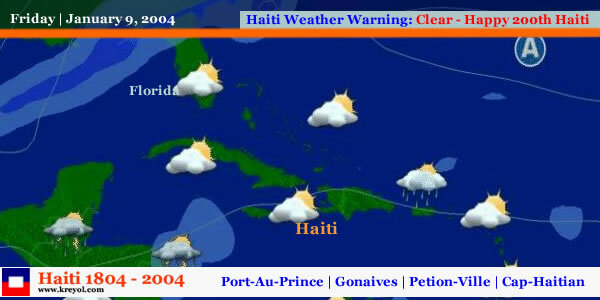 See ������ Qwikcast.com forecast for Gonaives,HT. Tropical Storm Odette in the South Central Caribbean moving E/NE at 5 Mph with winds of 50 Mph . Tropical Storm Warnings have been issued for Hati and Jamaica and the Dominican Republic from Isla Saona Westward. A Tropical Storm watch has been issued for the SE Bahamas and the Turk and Caicos islands. 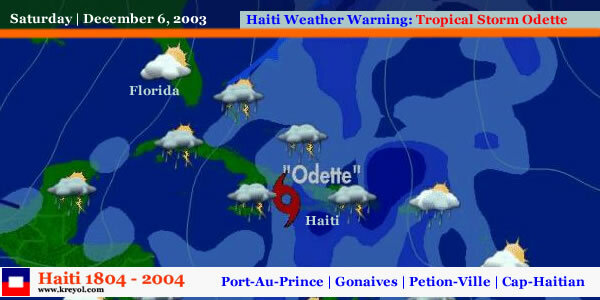 Odette formed Thursday, four days after the official end of the Atlantic hurricane season. Storm Warning - Tanpèt - Danje - Siklòn! Pandan siklòn yo ap fòme paj Meteyo sou Kreyol.com nan la pou ou. Swiv S�vis Nasyonal Meteyo, swiv yo - prè pou bay avètisman, siveyans, anons ak lòt enfòmasyon sou sitiyasyon danje 24 è pa jou. Ou ka achte yon ti radyo avek pil pou koute meteyo pou tout nouvèl sa yo. Note that feeds on this page are from local weather reporting services and reporting stations. Local observations or Current Conditions may not be available from the closest reporting station for a variety of reasons. Where some stations are closed overnight or on weekends, for instance, a local report will not be available. Other reasons may include the station being offline for repair or maintenance or various communications outages. Some damage to building roofs, doors and windows. Considerable damage to mobile homes. Flooding damages piers and small craft in unprotected moorings may break their moorings. Some trees blown down. Pa gen vrè domaj sou do bilding. Andomaje kay mobil ki pat kwochte atè a. Enpe domaj sou ansèy ki pat byen konstri. Enpe domaj sou bilding, pòt e fenèt. Kay mobil, pòt e fenèt demoli. Enpe pye bwa rache. Enpe domaj nan strikti nan tikay rezidans. Gwo pye bwa tonbe. May mobil ak ansèy ki te mal konstri tout detrui. Mi nan kay e do kay konplètman kraze. Strikti nan ti kay kraze. Destriksyon total nan kay mobil. Pye bwa, touf bwa, e ansèy tout voltije tonbe. Kay e bilding endistriyèl konplè-man detrui. Bilding endistriyèl konplètman kraze. Fenèt e pòt andomajman sevèman. Dabitid: Pou kalkile montan lapli ki tonbe nan yon siklòn, ou dwe divize 100 pa vitès siklòn nan an kilomèt pa lè (100¸vitès+ montan pous lapli ki tonbe). Biwo Sèvis Meteyolojik zòn nan kab genyen yon metòd estimasyon ki pi jis. M i dechire soti nan bilding blok siman, pye bwa 15 pye rache soti nan tè a, vag 20 pye kraze bò lanmè fòs siklòn ekstraòdinè. Siklòn kab toupi yon tonad. Inondasyon ak flach inondasyon soti nan yon lapli k ap vide ki akonpaye ak siklòn. Pi danjre toujou se tanpèt "surge" yon kouvèti andwo. Oseyan ki, nan dènye pwen li, kab 20 pye wo e 50-100 kilomèt. "Surge" kab devaste kominote bò lanmè pandan li pase sou tè a.
Yon siklòn se yo sistèm tan twopikal ak van ki rive e kenbe vitès a 74 kilomèt oubyen plis. Van siklòn nan yon mwayèn soufle nan yon sèk lonje alantou yon mitan ki kalm, ke yo rele "zye" siklòn nan. Zye a dabitid mezire 20-30 mil lajè, e tanpèt la kab blayi deyò a 400 mil. Lè yon siklòn pre tè, li kab pote anpil lapli, gwo van e tanpèt "surge". Yon sèl siklòn kab dire plis pase de semèn sou dlo ouvè e kab kouri tout longè sou "eastern seaboard". Van a 74-160 kilomèt kab blayi sou teren pou san kilomèt. Yo klasifye siklòn an senk kategori daprè vitès van. Kategori 1 se li ki pi fèb, van mezire 74-95 kilomèt. Kategori 5 se li ki pi fò, ak van ki mezire depase 155 kilomèt. Out ak septanm se mwa ki wo nan sezòn siklòn, ki dire de 1 Jen jiska 30 Novanm. Through our partnership with Amazon.com, we are offering an exclusive Haiti Kreyol.Com version of the award winning Alexa Toolbar. This toolbar is a great way to surf the web because it constantly provides you with Related Links (find sites that share the same subject and topic as the one you are surfing on). It's a great time saver, when blocking annoying pop-up ads. Plus, when you download and use the toolbar, you'll help support and promote all Haitian sites you visit. Haitian Americans and Haitian Diaspora in Brooklyn, Haitians in Boston, Haitians in Miami, Haitiens all over the world. Sakapfet! Sak Pase? !